Eight-year-old English painter Kieron Williamson hailed as a "mini Monet"
London, England (CNN) -- He has the deft brush strokes of a seasoned artist, but Kieron Williamson is just eight years old. The boy from Norfolk, in eastern England, has been hailed by the British press as a "mini Monet," a reference to the famous French impressionist. The title sits uncomfortably with Williamson who considers his style more reminiscent of famous English landscape painters. "No, I don't think I'm Monet at all, because Monet would do anything, do pictures of curly flicks. I'm more Edward Seago and Turner," he said, of the artists whose skill with a paintbrush was also discovered when they were young. Asked what Seago would make of his work, Kieron replied: "I think he'd say, 'make your sky a bit more dramatic and at least do some more cows in the foreground.'" Kieron's growing list of international customers may take issue with the youngster's harsh critique of his own work. A recent exhibition of 33 of the boy's paintings sold out in 27 minutes, raising £150,000 ($237,000). An oil painting called "Sunrise at Morston" went for £7,995 ($12,700), while another, "Marsh at Sunset," sold for £6,750 ($10,724). "It's been remarkable," said Adrian Hill, the owner of the Picturecraft Gallery in Norfolk who offered early advice to the budding painter and now exhibits his art. "They camped outside for up to two days beforehand, traveling as far as from South Africa, Arizona in the States, New Jersey and New York. "We had phone bids from Hong Kong, certainly from the States, and other parts of the UK," Hill said, adding "It was a very dramatic 30 minutes." No, I don't think I'm Monet at all, because Monet would do anything, do pictures of curly flicks. According to Kieron's website, the eight-year-old started drawing at the age of five while on his first family holiday to the seaside in Cornwall, western England. His early sketches were of boats in a nearby port, but as the holiday progressed he added surrounding hills and houses. 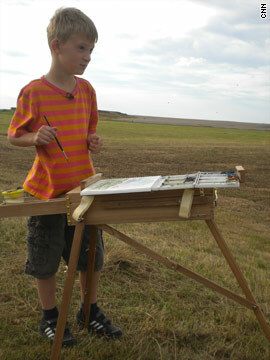 Kieron's parents encouraged his interest, taking their son's paintings to the local gallery for an expert's opinion. They now maintain a website, newsletter and Facebook fan page to give Kieron's followers constant updates on his progress. "We don't know where Kieron's talent comes from," said his mother Michelle. "(His father) Keith and I both collect art and we've been visiting Picturecraft for about eight years now." "I'd like to be able to take the credit but I can't. I tried a watercolor recently -- I used his paints, his paper, his palette -- I couldn't produce anything like Kieron does," she said. She is keen to impress that her son has other interests away from his palette. "Kieron's other big passion is football at the moment -- he belongs to the school football team and he and Keith will play at the park. He's enjoying table top football -- he's quite competitive in sports. He's taking swimming lessons -- he's keeping busy. He wants to try fishing next," she added. Kieron says he likes painting because "it's easy" and it "chills me out," but his relaxed attitude to his artwork belies a fierce ambition to make it to the very top. Of the prices fetched for his paintings, he says "I thought they'd be selling for a bit more." When asked where he'd like his paintings to be displayed, he answers: "I think the Queen has lots of pictures and most of them are Edward Seago's. I would like one of the pictures to be mine." His parents are saving up the proceeds of his sales to buy his own artistic retreat. "Kieron has asked us to start looking for property down in Cornwall for him as a holiday home. He just loves the idea of going back down there and having his own location so he can go back and paint the scenery down there. Cornwall is where it all started for him," she said.